Republican Utah Senator Mitt Romney. DONALD TRUMP BRANDED fellow Republican Mitt Romney a “stone cold loser” for failing to defeat Barack Obama in 2012, but the conservative presidential nominee-turned-Trump-critic exacted his revenge yesterday by winning a US Senate seat. Romney (71) defeated Democrat Jenny Wilson in their race to succeed retiring veteran Senator Orrin Hatch of Utah, setting himself up for a six-year Washington stint as an elder political statesman largely immune to Trump’s aggressive influence. 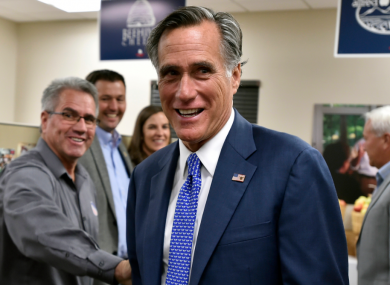 Romney, who is Mormon, ran a successful campaign in a majority-Mormon western state that has had mixed feelings about the brash and combative president. It marks a return to the national stage for Romney, a wealthy businessman and former Massachusetts governor who remains popular in Utah for saving the 2002 Salt Lake City Winter Olympics from being felled by a corruption scandal. In January he is expected to bring his strong foreign policy voice to Washington, but he also will be closely watched for how he handles the president. Will he be a thorn in Trump’s side on Capitol Hill, embracing the high-profile role taken on by the late senator John McCain, or has his revulsion of the president cooled over time? In March 2016, Romney was among Trump’s loudest Republican critics. He called him a con man and a “phony”, savaging the candidate’s temperament and business record, accusing him of creating “scapegoats” of Muslims and Mexican immigrants, and warning of the various dangers of a Trump presidency. The stinging denunciation resonated, but Trump swatted it aside, mocking Romney for having “choked like a dog” against Democrat Obama in 2012. Shortly after Trump’s victory, it appeared that the two had enjoyed a rapprochement when the president-elect invited Romney to dinner in New York. Observers giddily interpreted the get-together as an interview for the secretary of state position. But the prospect disintegrated quickly. Trump endorsed Romney’s campaign, tweeting this year that Romney would make a “great Senator and worthy successor” to Hatch. Romney himself has signalled an alignment on multiple fronts, writing in June that he supported Trump’s tax cuts and his slashing of “unnecessary regulations”. But he insisted he would stand up to the president when necessary, such as “when the president says or does something which is divisive, racist, sexist, anti-immigrant, dishonest or destructive to democratic institutions”. In July, he publicly castigated Trump for his “disgraceful” decision to stand next to Russian President Vladimir Putin in Helsinki and side with him over American intelligence agencies about whether Moscow interfered in the 2016 US election. And just five days before the midterms, Romney rejected Trump’s attack on the free press. “No American president has ever before vilified the American press or one of its professional outlets as an ‘Enemy of the People,’” he wrote. Email “Mitt Romney, who Trump branded a 'stone cold loser', wins Senate seat ”. Feedback on “Mitt Romney, who Trump branded a 'stone cold loser', wins Senate seat ”.